Real estate investment trusts (REITs) are dominating the dividend market right now – and it's a good time to buy a REIT ETF (exchange-traded fund) to play this trend. REITs are companies that own or finance income-producing real estate properties. Like mutual funds, REITs provide investors stable income streams and capital appreciation. They are typically associated with shopping malls, office buildings, warehouses, hotels, and apartments. And they've been tearing up the market lately. The Dow Jones REIT Index is up 13.9% in the last year. The FTSE NAREIT All REITs Index saw a 27.2% total return in 2014. The S&P U.S. REIT Index, which measures all public REITs based in the United States, has jumped 11.1% in the last five months alone. Most dividend plays, including REITs, perform well during periods of low interest rates. The 10-year Treasury note currently hovers around 2.2%. Its yield has dropped 10.4% since August. Speculation concerning rate hikes still lingers. Friday's February jobs report showed the unemployment rate fell to 5.5%, which means the Federal Reserve could hike rates this year. "If we gain confidence and continue to see the labor market improving, we will consider still raising rates," Yellen explained in her Feb. 25 monetary policy report to Congress. But the Fed doesn't want to spook the market. It's not going to make any drastic interest rate changes any time soon. REITs boast their own attractive qualities separate from other dividend investments. Their dividends are reliable because they come from constant streams of rent money paid by the REIT's property tenants. The IRS also requires REITs to annually distribute 90% of their taxable income to shareholders. This law makes them among the highest dividend-paying investments, with a 4.1% average yield for all REITs as of November. That's higher than both General Electric Company (NYSE: GE) and Caterpillar Inc. (NYSE: CAT) – two of the top five highest-yielding stocks on the Dow Jones. 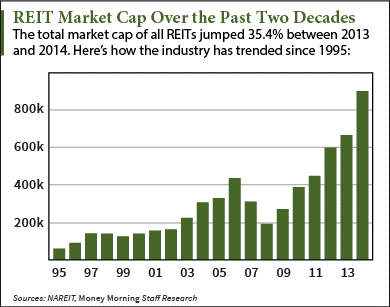 And the REIT industry is a profit gold mine that keeps expanding. The industry's total market cap was $907.4 billion in 2014. That marks a staggering 235% increase since 2009. At this rate, it is well on its way to becoming a $1 trillion industry within the next few years. According to the National Association of Real Estate Investment Trusts (NAREIT), there were 216 REITs on the U.S. market in 2014, a 52.1% increase from 142 in 2009. 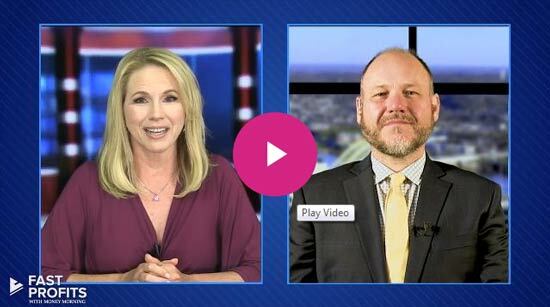 The number is growing as more REITs continue to hit the market. "It was a pretty sensational year for REITs," said Rich Moore, managing director at RBC Capital Markets, in an NAREIT report. "Going [into 2015], you're going to have a positive year on the fundamentals side, no question about it." Three REIT IPOs have already made huge waves in 2015. InfraREIT Inc.'s (NYSE: HIFR) deal on Jan. 30 raised $460 million, making it the largest REIT IPO since Paramount Group Inc.'s (NYSE: PGRE) $2.3 billion deal last fall. In February, Easterly Government Properties Inc. (NYSE: DEA) and Great Ajax Corp. (NYSE: AJX) respectively raised $180 million and $71 million. 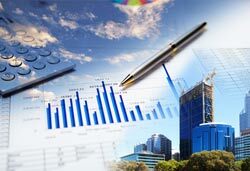 Citigroup Inc. (NYSE: C) researchers expect U.S. REITs in 2015 to stay boosted by strong capital flows from real estate investors around the world. And an REIT ETF is the best way to cast a wide net over the booming market. About $10.7 billion was invested in REIT ETFs last year, along with $1.2 billion already this year.